I’ve been a bit quiet here on the blog which generally means one thing… I’m up to no good! Oh no, wait, that’s my toddler. But I am up to something. Something I’m pretty excited about actually, and glad I can finally share. A few weeks ago I signed up for a course in Social Enterprise. Within the first 20 minutes of my first class I knew I’d made the right call and that this was the catalyst I needed to get my project going. Let me back up. I’ve wanted to start up my own nonprofit organisation for ages. I used to daydream about starting up a youth theatre company or a vegan outreach group. In fact, when I graduated uni, my Senior Project involved creating a business plan for an arts program for teens that never came to fruition. It always seemed that I didn’t have the right confluence of idea, timing, and resources. As you might recall I recently started getting a little antsy about where I was heading, career-wise. That led to lots more daydreaming, brainstorming, researching, Pinteresting and eventually, an idea was born. It’s changed a lot as I’ve worked more on it, but it actually was inspired by my new Playgroup. I love going to Playgroup and have met some awesome mums through it. But I often find myself getting frustrated that Luella wants to run around and go on swings instead of sitting down and painting. I don’t want to force art onto her and of course don’t want to stifle her energy. But I still want to nourish her creativity. So I started thinking back to the arts and education courses I’d done in uni and remembered a teaching style called “Reggio Emilia”. 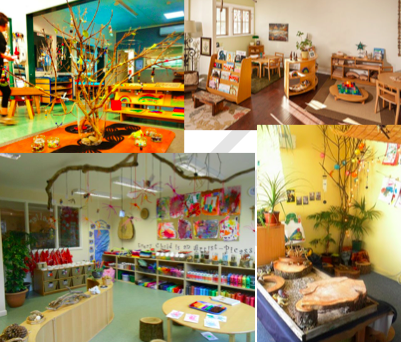 Some Reggio Emilia inspired classrooms. There’s lots more to it than that obviously. I’ve been reading everything on the topic I can get my hands on, and have really come to love it as a philosophy. One big thing they talk about is the way environment shapes how a child learns. So as I started thinking about how I could teach classes in this way and how I could possibly set up a space to fit into this ethos I began to realise that what I really needed to do was to create a much less structured program and find my own space. I started looking into space rentals and that’s when everything began clicking into place. The City of Sydney has commissioned a company to award what they call “short-term creative tenancies”. It’s basically pop-up shops for art projects. You pay a fairly minimal rent for a period varying between 3-12 months and are given a space that’s basically between leases, with the idea that you’ll transform it into something for the community. So after I get a whole bunch of ducks in a row I’ll be applying to set up Open Door Art Space, a place for young children (toddlers – pre-schoolers) to freely explore, experiment and create with materials we provide, in a space designed to stimulate their imaginations. I’ll keep that description fairly vague and loose for now. Through my course, I get business coaching, and so I’m working with my coach on the budgeting, fundraising and legal aspects. It’s looking like what I need to do first is establish a nonprofit umbrella organisation for some management structure, so I’ve begun recruiting board members and will soon be organise an AGM. (Fancy!) My working title for it is Sydney Creative Play Collective. I’ve got some of the aforementioned awesome playgroup mums on board so far. But dads and non-parents are welcome too! At some point in the near future I’ll be organising an art supplies drive/fundraising event, so watch out for that. I can’t wait to share more updates as they come. Watch this space.